After a long day up on your feet or a long flight, you may notice that your ankles, legs and feet start to swell. For those of you that suffer from this swelling, this is called edema. And here you’ll find some simple exercises on how to get rid of swollen feet fast. For the most part, this swelling is completely normal, but can also be a sign of a more serious medical condition (1). Edema is swelling caused by excess fluid trapped in your body’s tissues. It’s quite common in the extremities, especially in the legs and feet (2). Edema is often caused by pregnancy, injury, infection, medication, hormones, obesity, arthritis, lymphedema (blocked lymph channel), venous insufficiency, blood clots and heart, liver, or kidney disease (3). 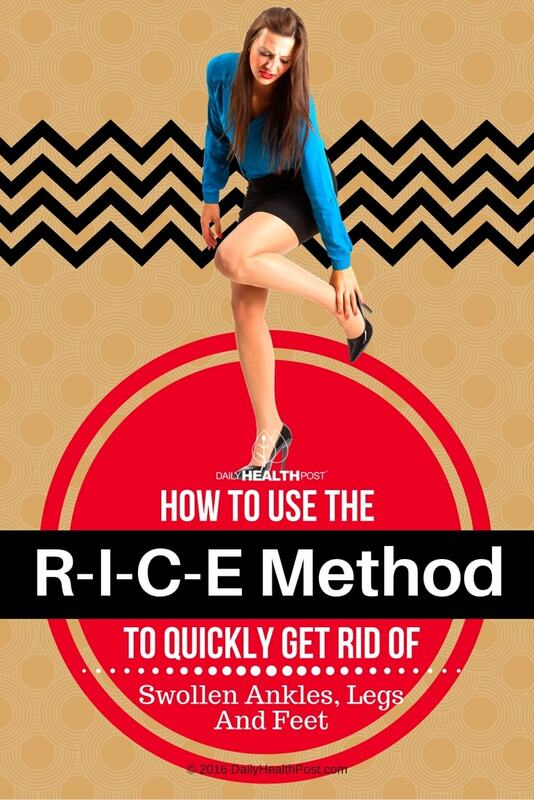 One of the quickest ways to relieve swelling is the RICE method (4). Compression: Wrapping your feet or ankles in a bandage or slipping on a compression sock can help reduce swelling and gently squeeze blood up your leg (5). Your body tries to maintain a sodium/water concentration outside cell walls that’s approximately the same as sea water (6). Excessive insulin can causes fluid and sodium retention, especially in type 2 diabetics. Over time, it can lead to high blood pressure and congestive heart failure (7). In some cases, dehydration can actually cause edema. When you aren’t getting enough water, your body tries to push too much water back into your cells, causing them to swell (8). In serious cases, it can even occur in your brain and cause permanent damage. Eating natural diuretic vegetables can help release fluid build-up in your body tissue (9). Garlic also contains allicin, which is a vasodilator, meaning that it can dilate blood vessels and promote blood flow (10). Magnesium helps to alleviate fluid retention in menstruating women (11). It can also relieve muscles cramps that may accompany edema (12). If you spend most of the day standing or sitting down, flex and extend your ankles and knees throughout the day. It’s also important to avoid crossing your legs as your sit (13).